A Cumbrian family have spoken of their "terror" after their house caught fire when it was struck by lightning during Storm Gareth. Amanda Glencross said lightning shot down the chimney of their home in Cotehill, near Carlisle, sending a gas fire hurtling across the room. Firefighters spent about an hour at the scene, although no-one was hurt. The storm left more than 2,000 people in Cumbria without power and overnight wind gusts of 69mph (111km/h). Mrs Glencross, 43, who is a mother to nine-year-old twins, said her terraced house was damaged inside and out by the strike in the early hours of Wednesday. 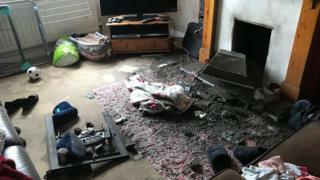 She said: "A huge bolt of lightning hit the house and took part of the roof off and shattered the chimney. "We knew there was a storm coming but didn't expect lightning like this. "Myself and the kids were in bed but my husband Phil had fallen asleep on the couch. "We were all absolutely terrified. It was like a bomb had hit the house. Our ears were ringing for ages afterwards." Mr Glencross added: "We all know we've been very lucky. "The children were hysterical, but we managed to get them calmed down and we were able to stay with relatives for the rest of the night." Electricity North West said about 2,000 properties lost power overnight because of strong winds, although most have now been reconnected. Elsewhere in the county there was minor damage, including a tree that was brought down by high winds at Kendal College. There have been no serious injuries reported. Two yellow "be aware" Met Office weather warnings are in place until Thursday. Video Storm Gareth: Why is the weather so stormy right now?